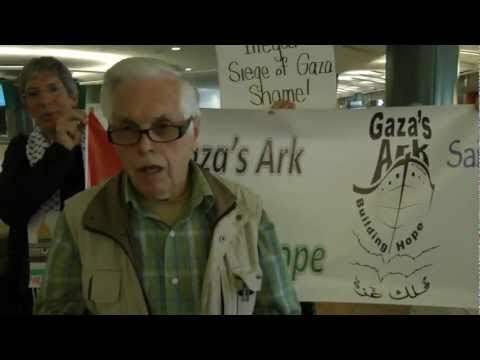 October 25, 2012; Retired Canadian MP Jim Manly’s arrived in Vancouver on his way to his home in Nanaimo, greeted family and friends and gave a statement on the IDF’s forced seizure of the Estelle in international waters. He spoke to media about being captured and help in Israeli detention, but added that the focus should be on the ongoing treatment of Palestinians, and less so on the crew's capture, tasering, and the act of piracy by the IDF. After forcibly seizing the Estelle, the all balaclava clad Israeli soldiers took down the Finnish flag and raised the Israeli flag on the ship.